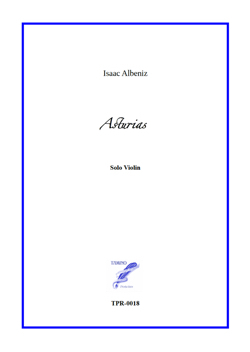 If you like the solo piano or solo guitar version of Albeniz's Asturias, you will love this Solo Violin version. Synopsis Originally written for solo piano, this piece has also been arranged for guitar by Tarrega, and for symphonic orchestra. The piano gesture of alternating between left hand and right hand is replaced by quickly alternating between two strings. Transposing from G minor to D minor, this arrangement makes great use of open strings, pizzicati, harmonics, double stops and other instrumental gestures that are characteristic of the Violin.